A vintage stand at El Mercado de Motores. You probably don’t know this about me because it’s nerdy and I keep it to myself, but I like transportation. No, I don’t have elaborate model train sets in my basement or hundreds of hand-painted balsa wood airplanes. But I get a kick out of efficient transport systems, especially public transportation or high-speed trains. So, imagine my happiness when I discovered that there’s a market in Madrid’s Museo del Ferrocarril. Trains and a market? Is this heaven? On the first weekend of the month, artists and antiquarians set up their stands alongside centenarian steam trains and art deco train cars. They peddle their artisan, vintage and gourmet goods while live music plays on the terrace outside. I wasn’t sure what to expect — I was picturing something more akin to El Rastro, which is fun, but in the same way junk-filled rummage sales are fun. Upon arrival to the Mercado de Motores, however, I was immediately impressed by all the beautiful things for sale. The museum’s main depot area hosts the hand-made and artisan goods, while the space outside the museum is filled with antique and vintage finds. You can even hop on a miniature steam train, but only if you’re accompanying a child. We learned that the hard way. And here we are, in June. It’s part of the block-lettered expiration date on my Spanish residency card, yet I somehow never thought it would arrive — it always seemed like some distant, intangible construct of time. In Madrid, its arrival has been quiet and understated, marked by warm breezes and long, sunny days. Madrileños and tourists alike are flocking to the city’s countless terraces and plazas, making each barrio hum with laughter and clinking glasses. Summer is here, and everything is as it should be. Except for my growing feelings of indecision and doubt. I’ve been keeping my plans quiet because I’m still not sure what they are, but here goes: at the last minute, I decided to renew my position here in Madrid. I adore this city, thanks to its endless supply of museums, restaurants, nightlife, terrazas, and concerts. I love speaking Spanish, and I’ve made some wonderful friends from all over the world. That said, I don’t think I’m coming back. Why? For the past seven months, I spent nearly six hours a week repeating 50 basic questions to hordes of second-graders. The goal was to prepare them for the notorious Trinity exam, but most of them only memorized the questions and the proper responses since the teacher never taught them what the questions meant in the first place. And then there are the kids themselves, many of whom are so talkative and disrespectful that I can’t teach them anything. I’m forced to spend half the class period trying to keep them quiet while the teacher sits on the computer or leaves the room entirely. Don’t get me wrong, some of my classes are good. Fun, even. (Read: Only my classes with teachers who prepare coursework and control the students’ behavior fall into this category.) I adore all of the first-graders, most of the second- and third-graders, and even a few of the fifth-graders. Sometimes we do special projects or help with holidays, which is usually a good time. But the teachers I work most closely with are so frustrating that I’m not sure I could handle another year. Persianas, the typical Spanish blinds. Source. They aren’t necessarily good, and they aren’t necessarily bad. They’re just curious. What are these big metal things outside my window? Storm shutters? No, friends, those are persianas, the typical Spanish metal blinds that double as blackout shades. They’re in almost every home, apartment and building, including my school. Want to protect your window from wind and weather? Lower the persianas. Want to block out all sunlight as you regret the previous night’s activities/eat chips in your bed? Persianas are your new best friend. I’m personally not a huge fan of them — they make the room too dark for my taste. However, almost all my neighbors put them down at night. Either they’re afraid of people peeking in, or they really, really hate being woken up by the sun. I would sleep till 12 if I used my persianas, but hey, everyone’s different. And you really can’t beat them for blocking out that notorious Spanish sun and heat, which is going to be very important come June. Side note: The rattle of persianas being raised in the morning is, oddly, a sound that will always remind me of Spain. Two weekends ago, my housemate Irene and I were in the living room. It was about 60º F (15º C) and sunny, so we opened the door to the terrace. As we did so, I heard a strange, lilting melody coming from the street below. A few minutes later, I heard it again. I asked my Spanish roommate, Irene, what the sound was. She told me it was the el afilador de cuchillos, or knife-sharpener. 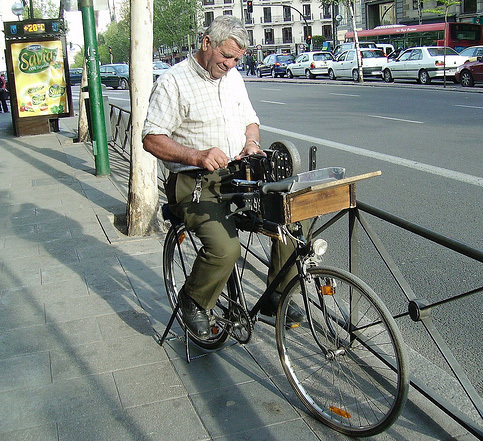 He travels around town, usually on a specially outfitted bicycle or motorbike, playing his melody on a harmonica or pan flute. When customers hear him, they bring their knives and he sharpens them on the spot. Most of their regular business comes from fishmongers and butchers who prefer to have el afilador to come to them, rather than having to take their knives elsewhere to be sharpened. Irene also said the tradition of el afilador is dying in Spain. It’s slightly more common to see them in small towns, but, overall, they’re disappearing with each passing year.